Bloomberg New Energy Finance, Ceres and Ken Locklin have collaborated to examine more closely total volumes of capital that will be required to fund clean energy power project development in the electric sector over the next 2.5 decades. ˗ To examine total volumes of capital required in electricity generation under both a “business-asusual” (BAU) scenario and under a “two-degree C” scenario (2ºC) in which sufficient steps are taken to increase clean energy build to ensure global temperatures rise no more than 2ºC. Thus the project name Mapping the Gap, as it aims to better understand the funding “gap” between BAU and 2ºC scenarios. ˗ To estimate clean electric power infrastructure investment flows via various investment subsectors, such as traditional project finance, asset-backed securities, green bonds, and others. 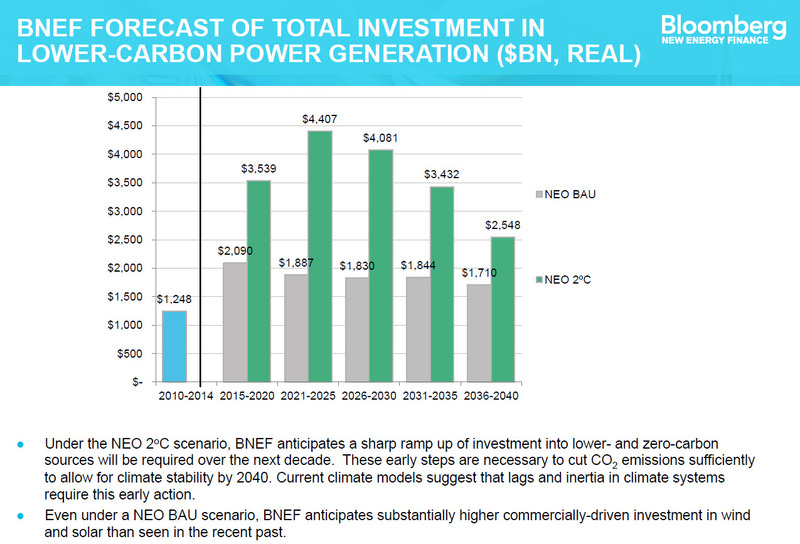 ˗ BNEF anticipates a sharp ramp up in overall investment into lower-carbon technologies over the next decade, assuming the world seeks to “lock in” CO2 reduction benefits earlier that will pay dividends in critically needed carbon pollution reductions over the longer term. ˗ The 2ºC scenario represents a $12.1 trillion investment opportunity for new renewable electric power* generation over 25 years, or $485bn/yr on average, BNEF estimates. Under BNEF’s BAU view, that opportunity is $6.9 trillion, or $277bn/yr. Thus the “gap” is $5.2 trillion or $208bn/yr. ˗ While these sums may appear daunting, they are dwarfed by global financial markets. In the US alone, consumers borrowed $542bn over the past year to purchase cars, and assumed $1.4 trillion in new mortgage debt. Clearly, the financial markets have the capacity to absorb the financing “gap” between BAU and 2ºC.